Revered Kai of Bajor. Lost her son in the Kendra Valley Massacre. First recognized Benjamin Sisko as the Emissary of the Prophets. Anthropology Orb artifacts may not be nullified. 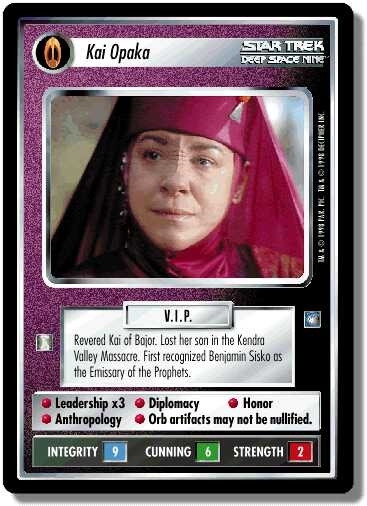 Characteristics: "Reshape the Quadrant"-related cards, affiliation, Orb icon , Kai, Bajoran species. There are 36 entries for Kai Opaka (ST1E 5 R 151) at the Tradeplace (32 haves and 21 wants). Click here to see all trade list entries for this Rare card!